Senior ministers and commanders on the ground believe they have created the right conditions to open up a dialogue with “second-tier” local leaders now the Taliban have been forced back in a swath of Helmand province. They are hoping that Britain’s continuing military presence in Helmand, strengthened by the arrival of thousands of US troops, will encourage Taliban commanders to end the insurgency. There is even talk in London and Washington of a military “exit strategy”. The second tier of the insurgency are regarded as crucial because they control large numbers of Taliban fighters in Pashtun-dominated southern Afghanistan. The first tier of Taliban commanders – hardliners around Mullah Omar – could not be expected to start talks in the foreseeable future. The third tier – footsoldiers with no strong commitments – are not regarded as influential or significant players. The change in tactics was revealed as the Ministry of Defence announced that two more British soldiers were killed in southern Afghanistan. One, from the Light Dragoons, was on patrol in Operation Panther’s Claw; the other, a soldier from the Royal Artillery, was killed on foot patrol in Sangin. Ten soldiers have died in Operation Panther’s Claw. Mayall is responsible for formulating operational policy in Afghanistan and his remarks gave added weight to interventions by senior ministers yesterday. David Miliband, the foreign secretary, and Douglas Alexander, the international development secretary, yesterday held out the prospect of reconciliation between the Afghan government and Taliban fighters prepared to renounce violence. For more than a year, British intelligence officers have been instigating contacts with Taliban commanders and their entourage. But their task has been very delicate given the sensitivities of the Karzai administration in Kabul. The situation has been complicated further by the influx of hardline and ideologically motivated fighters joining the Taliban and other insurgent groups from across the Pakistani border. But the fact that senior ministers and military commanders seized on the apparent success of Operation Panther’s Claw to highlight the possibility of talks with the Taliban reflects their concern about the lack of progress so far in Nato’s counter-insurgency. Significantly, and as if to counter public aversion to talks with the Taliban, ministers and military commanders alike compared the current campaign in southern Afghanistan to anti-terrorist operations in Northern Ireland. A ComRes poll in today’s Independent suggests most people now believe British troops should be pulled out of Afghanistan. Most of those who responded (58%) said the Taliban could not be defeated militarily, and 52% of those surveyed said troops should be withdrawn immediately. This compares with a Guardian/ICM poll earlier this month which showed that 42% of those surveyed wanted troops to be withdrawn immediately. America’s priorities in Afghanistan will be spelled out in a briefing paper drawn up by General Stanley McChrystal, the new US commander in the country, due to be handed to Barack Obama tomorrow. He will emphasise the need for speeding up the training of Afghan troops, according to defence sources. He is also expected to ask for more troops from Nato allies. British military commanders are drawing up contingency plans to increase the number of British forces to more than 10,000 from the current 9,000. 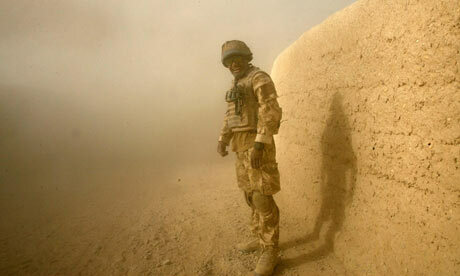 The number of British troops that might be deployed in future was “out of my hands”, he said. But he added that as the number of Afghan army recruits increased, the number of Nato forces required to train them also increased.